Shirts With Random Triangles: Nick Saban says SEC Network won't affect how Alabama recruits players. Nick Saban says SEC Network won't affect how Alabama recruits players. Will the coming dawn of the SEC Network in 2014 change how Alabama handles recruiting? 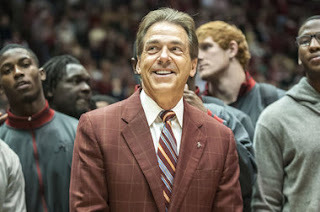 Not according to Crimson Tide head football coach Nick Saban, who responded to the question before speaking at the Crimson Caravan stop in Huntsville in a way only Saban could respond. "We have a standard for what type of player we are looking for," Saban said prior to a Crimson Caravan meeting at Huntsville's Von Braun Civic Center. "We look at character, at academic background, at how (prospects) meet certain critical standards, and, of course, we look at their physical ability to play the position we recruit them for. It is not really good practice to recruit guys who don't have a role on your team. If they meet those criteria, it is not important where they are from specifically. "At the same time, we try to find every single player in the state who can meet those criteria, because (those players) deserve the opportunity. Then we try to do a good job within a 500-mile radius around our campus, and then we will go over the top to try and get the best players no matter where they are, if they are interested in us. Some are and some aren't, but the whole idea is to get the highest quality players you can." Saban also explained that even with the SEC Network expanding the conference already huge media exposure, recruiting players remained "still about relationships." Meaning that personal contact with recruiting prospects will still mean a lot more than time on television.